Where are scorpions during the winter? November through February scorpion activity slows way down. Scorpions are usually all over the Phoenix Valley, but as night temps drop under 70 degrees we don’t see them! That’s because Arizona Bark Scorpions gather to nest in sheltering areas till it warms back up. Scorpions are survival machines and survive the coldest winters the Phoenix AZ Valley has. In fact, Arizona Bark Scorpions live for up to six years! Scorpions DO NOT die during the winter, or magically disappear when it cools down. You may not see any scorpions during the winter, but bark scorpions do not die or leave. They gather to nest together like a scorpion bomb waiting to explode in the spring! Unless you have a scorpion infestation, most Phoenix Valley residents do not usually see scorpions during the cool winter months. Every year the weather is different. But in the Phoenix Valley Scorpions do not normally leave nesting areas to hunt or mate till March or early April. Scorpions emerge from nests when night time temperatures rise back up above 70°. Most scorpions are solitary in nature, BUT during winter months Arizona Bark Scorpions GATHER to nest in large groups of 20-30 scorpions! Scorpions nest, or hibernate, in and under: bark, lumber piles, bigger landscaping rocks, wall voids, structural cracks and crevices, under concrete foundations and expansion joints, in block wall fences, in warm walls or attic spaces. Other scorpions species hibernate in ground burrows. If you’re seeing scorpions between November and February, you likely have scorpion nests close by… Time for Scorpion Pest Control! Scorpions nesting inside walls or attic spaces may emerge inside the house (it’s warmer there). Scorpions do not stay in the attics when it warms up at all. As attic temps rise above 100°, which happens fast in the Phoenix Valley, scorpions leave. 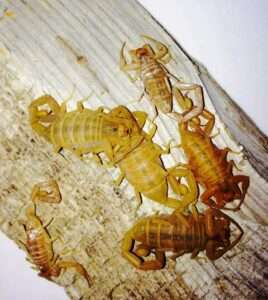 If you see a scorpion inside your home during the winter you may have a group of bark scorpions nesting close. Effective scorpion control is an ongoing process because when protective barriers wear off, and they only last 30-45 days, scorpions from surrounding areas move right back in! Seeing scorpions around your property during winter months is a good indication of a bigger problem… Scorpion encounters during the winter are a sign of scorpion nests, or hibernating groups, in your home and around your yard. Arizona Bark scorpions gather to nest during the winter inside wall voids, in warmer attic spaces, under large landscaping rocks, under concrete slabs or in concrete expansion joints, inside tree bark, under logs, in block wall fence crevices and in other structural cracks and crevices. There are several things you can do to prevent scorpions from infesting your property! Spring and summer scorpion infestations are easily prevented during the fall and winter months with regular service. PREVENT scorpions from infesting your home and yard during cooler months by continuing monthly scorpion pest control services all year round! It’s common for people to think they don’t need scorpion control service during cooler months because they don’t see scorpions as often. But they’re WRONG! Stopping service during the winter allows scorpions to gather and nest around your home and yard. Bark scorpion nests are like ticking time bombs that explode as soon as night temperatures rise above 70° in March or early April! You can also seal cracks and crevices 1/16 of an inch and bigger around your home and yard to prevent scorpions from getting in to nest! Areas to seal include block wall fence cracks, weep areas at the base of your home, eves, around doors and windows, concrete expansion joints, around pipes and wires that enter your home, etc. Providing Scorpion Control in Mesa, Phoenix, Chandler, Glendale, Gilbert, Scottsdale, Queen Creek, Maricopa, & ALL surrounding areas.